Sometimes God speaks through the Bible, sometimes he speaks through other people and then there are the times his divine appointment seems to simply fall from the sky. 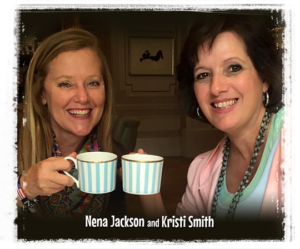 Long-time best friends Kristi Smith and Nena Jackson were sitting in park when a message from the Lord seemed to float from the tree overhead and into their souls, igniting a passion for a new calling. Kristi and Nena have since labeled this phenomenon the “download,” the time when God gave them the desire for “Fruit That Lasts,” a book series that helps children understand the fullness of God the Father, God the Son and God the Holy Spirit and, ultimately, how to cultivate the fruit of the Holy Spirit. Starting the journey with only a title and blind faith in God, the women prayed over their project as more essential elements of the series emerged. Kristi and Nena decided to model the two child characters after themselves, but in the form of fig and pomegranate trees named Franny Fig and Pom Pom Pomegranate. The two grandmothers in the story would be modeled after their own grandmothers, Nana and Rue Rue, and also characterized as fig and pomegranate trees. Kristi and Nena could see God’s hand in the direction of the storyline and continued to follow in faith. After they wrote the first book, Kristi and Nena came across a passage in the Bible that explained how figs and pomegranates were brought back to Moses and his followers to convince them the land was the Promised Land (Numbers 13:23). Just as the figs and pomegranates served as symbols of prosperity and hope to Moses’ followers, the characters in Kristi and Nena’s books lead the reader to spiritual growth and understanding. Throughout their lives, Kristi and Nena’s grandmothers had been an immense source of wisdom and strength, and they wanted to leave a legacy for other children and grandchildren through these characters. Best friends since first grade, the two women joined forces in ministry in 2010, speaking and traveling around the world. They even wrote a Vacation Bible School curriculum, which they have taken to Kenya on several mission trips. Well into their professional careers and with grown children, Kristi and Nena were surprised by God’s calling to write a series of children’s books. And, with more prayer and faith, they soon realized God’s plan was even bigger than the books. They are working on videos, teaching curriculum, merchandise and more that will speak God’s truth to future generations. Although they are now working on “Fruit That Lasts” material and a separate devotional full-time, up until recently, Kristi and Nena had to juggle writing their series, full-time careers, and families. Kristi worked as a nurse in Birmingham, Alabama, where she lived with her husband and two children, while Nena was called into church ministry in Charleston, South Carolina, with her husband and four children. Although living in different states and collaborating on a book series might seem difficult, Kristi and Nena found scheduling time to write over the phone worked best for them. While the books are truly a representation of each woman’s creativity, they have their specialty areas. When it’s time to turn the rough draft of each book into poetry, Kristi takes the lead, and on administrative tasks, Nena steps in. Plus, they have found partners and fellow collaborators to help turn their vision into a reality. Every step, they say, has been directed through divine connections. And in one instance, God showed up in an awe-inspiring way. Nena is a part of a ministry called Alpha, a beginning Christian course designed for non-Christians and Christians wanting to explore their faith and ask questions. Through Alpha, Nena and her husband, Scott, met Cyril, a French artist who took the course. Despite the teachings in Alpha, Cyril still wasn’t convinced. Ever mindful of God’s prompting, Nena told Cyril about “Fruit That Lasts” and showed him a pencil sketch in hopes he might be the illustrator they needed. A few months later, Cyril reached out to Nena, letting her know he had accepted Christ as his Lord and Savior and invited her and Scott to his baptism. After his celebration, Cyril met Nena for coffee and read the first book in the “Fruit That Lasts” series. “Now, I want to illustrate this project even more because I am a Christian,” Cyril told her. 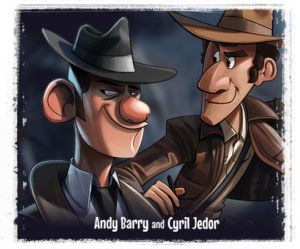 He took the project to his company, Moondog Animation Studio in Charleston, where Cyril and the Moondog team brought the “Fruit That Lasts” characters to life. Still searching for a publisher, Moondog introduced Kristi and Nena to Jennifer Tubbiolo, co-owner of Relevant Pages Press, now the project manager for publishing the books. Kristi and Nena will tell you only God could have connected them with professionals they would otherwise never have met. From that day on a park bench to reviewing the first printed copies of their book, Kristi and Nena haven’t wavered from their mission. They know how it important it is to be “uncompromisingly steadfast in the message” as they work to capture the attention of a young audience.